Living in the idyllic coastal town of Ocean Grove, Australia has helped shape Andrea Robertson into the award-winning singer/songwriter she is today. With music that’s as natural as it is soulful, her vocals fuse together blues, roots, folk and country with a dash of rock; all with a highly appealing and slightly vintage vibe. Much like the ebb and flow of the ocean, her music is varying, emotive and thoroughly engaging. Releasing her debut album "It’s About Time" in July, 2014, Andrea worked with fellow industry greats Chris Wilson and Sarah Carroll (also crowned as the ukulele Queen of the Bellarine) in shaping a highly celebrated CD. 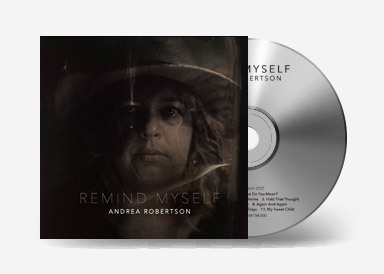 With her second full-length album "Remind Myself" released in November 2017, Andrea has once again worked with Australian Blues Legend, Chris Wilson and also welcomes collaborations with Tim Neal (hammond organ and tenor saxophone) and Robert Calvert (alto saxophone). Throughout her career Andrea has performed to small and large crowds alike, garnering the prestigious recognition of her craft along the way. In 2017 Andrea was one of the dual recipients of the highly coveted Queenscliff Music Festival's Emerging Artist Grant in 2017. She was also the winner of the Ross Lipson Award at the Queenscliff Music Festival in 2016, has had numerous songs short-listed in National songwriting contests and been commissioned for her songwriting skills. Her stunning new album ‘Remind Myself’ - released on CD and Vinyl as well as Digital Download - has been beautifully mixed and mastered by Sound Engineer/Producer, Nick Huggins (A Pocket Full Of Stones Studio and Two Bright Lakes) to a standard that has been compared with the likes of Gillian Welch and Jack White. From the feel-good opening track "Never Let You Go", this album takes you on an emotive journey, including the everyday and the ordinary through to social justice issues that impact each one of us in some way. But the closing track, "My Sweet Child", is a truly stunning number; stripped back to acoustic piano and soulful vocals recorded in her bathroom, it's a heartfelt dedication to her teenage daughter. Based in the beautiful coastal town of Ocean Grove, Andrea, David and their two children, Heath and Carly (talented musicians in their own right) can often be seen performing music together as The Von Robertsons - a name fondly given to them by locals - and gaining more recognition all the time as a family band with a difference. Andrea, along with her husband/drummer (David) are generous souls, regularly investing back in to the lives of young people and the local community in various ways; running music programs in schools, as private music tutors, leading community singing groups (Andrea) and drumming groups (David), and frequently supporting local events, causes and fundraisers. Andrea and David also run an adult music group called "Ocean Grove Acoustic Sessions" held monthly in their home town. OG Acoustic Sessions was established after seeing a need to provide adults who can play an instrument an opportunity to get together with other like-minded people, in a friendly, relaxed and non-threatening environment (and after having many parents comment to them that they wish they'd run something for grown-ups to come along to!). "Not everyone wants to perform; not everyone wants to be chasing gigs and trying to generate a following. Some people just want the chance to play and sing with other like-minded people, and at Ocean Grove Acoustic Sessions, they get their chance to do this." Andrea facilitates the group, providing new material at each jam session and OG Acoustic Sessions has proven to be hugely popular with attendees always looking forward to the next session. In addition to Andrea's other musical endeavours, she is a private music tutor (piano and vocals) from home and also from Ocean Grove Primary School during school hours. Andrea also took over the position of Choir Leader/Director of the Tides of Welcome Choir based in Queenscliff from folk/singer-songwriter, Tiffany Eckhardt, in September 2014, the Choir being founded by Sarah "The Ukulele Queen of the Bellarine" Carroll in 2003. The third independent album from Andrea Robertson, recorded over two sessions with a captive audience in the beautiful arts space known as New Hall, Point Lonsdale. 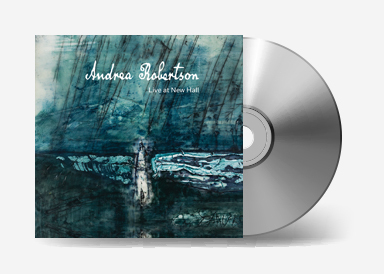 The stunning second album from Andrea Robertson is a must have for your collection; full of heart and soul, it will take you on a journey that celebrates both the ordinary and the extraordinary things in life. You will fall in love with this album - right from the feel-good opening track "Never Let You Go" through to the closing number "My Sweet Child", a dedication to her teenage daughter. The soulful debut independent release album from singer/songwriter Andrea Robertson. Featuring 10 original tracks that make this CD a well-balanced blend of rocky, toe-tapping numbers matched with heart-warming ballads and tunes that make you want to sing along - an album well worth adding to your collection.